Concentrating solar power (CSP) technology is poised to take its place as one of the major contributors to the future clean energy mix. Using straightforward manufacturing processes, CSP technology capitalises on conventional power generation cycles, whilst cost effectively matching supply and demand though the integration of thermal energy storage. Concentrating solar power technology provides a comprehensive review of this exciting technology, from the fundamental science to systems design, development and applications. Part one introduces fundamental principles of concentrating solar power systems. Site selection and feasibility analysis are discussed, alongside socio-economic and environmental assessments. Part two focuses on technologies including linear Fresnel reflector technology, parabolic-trough, central tower and parabolic dish concentrating solar power systems, and concentrating photovoltaic systems. Thermal energy storage, hybridization with fossil fuel power plants and the long-term market potential of CSP technology are explored. Part three goes on to discuss optimisation, improvements and applications. Topics discussed include absorber materials for solar thermal receivers, design optimisation through integrated techno-economic modelling, heliostat size optimisation, heat flux and temperature measurement technologies, concentrating solar heating and cooling for industrial processes, and solar fuels and industrial solar chemistry. 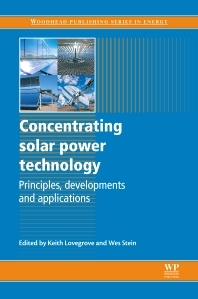 With its distinguished editors and international team of expert contributors, Concentrating solar power technology is an essential guide for all those involved or interested in the design, production, development, optimisation and application of CSP technology, including renewable energy engineers and consultants, environmental governmental departments, solar thermal equipment manufacturers, researchers and academics. Dr Keith Lovegrove is Head of Solar Thermal for the UK-based renewable energy consulting group, IT Power. Wes Stein is the Manager of the Commonwealth Scientific and Industrial Research Organisation’s National Solar Energy Centre, Australia.